SAN DIEGO â March 24, 2014 â Northrop Grumman Corporation (NYSE:NOC) and the U.S. Navy have successfully completed the first major milestone of the Triton unmanned aircraft system (UAS) flight test program, clearing the aircraft to fly at various altitudes, speeds and weights. During the test program, which is known as initial envelope expansion, the Northrop Grumman/Navy test team validated more than 568 test points. 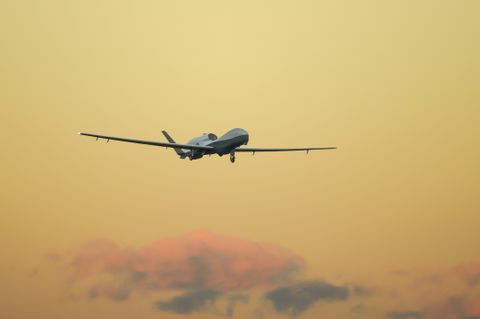 The flights took place at the company's manufacturing facility in Palmdale, Calif.
"Following Triton's first flight in May, we've seen a steady increase in the number of test flights and test points being accomplished," said Capt. James Hoke, Triton program manager with Naval Air Systems Command. "We're now working to fly the second test aircraft and then prepare to ferry both aircraft to Naval Air Station Patuxent River." The test team conducted 13 flights during this effort, including several long-endurance flights totaling 81 hours at altitudes up to 59,950 feet, Hoke added. Once both Triton test aircraft reach Naval Air Station Patuxent River, Md., the test team will install and flight test the aircrafts' sensor suite to validate the capabilities of each payload. "As part of this effort, thousands of hours of simulated flight tests have been conducted in our laboratory," said Mike Mackey, Northrop Grumman's Triton program director. "This is a valuable activity because we can review test points in simulated environments that leaves us with less needing to be cleared during actual flight tests. Not only does this save time, it also costs less money by flying only to ensure test points are cleared." The Navy plans to build 68 Triton UAS and they will be used with the manned P-8 Poseidon maritime patrol aircraft to conduct persistent intelligence, surveillance and reconnaissance missions across vast ocean and coastal regions.